I’ve always given my children a vast assortment of vegetables. I don’t force them to eat them food on their plate, but they aren’t allowed to choose something else for their meal. I make exceptions of course; for example, Theo, my 3-year old, hates potatoes and always has. Now, I grew up in a household where we had to at least try a bite of food on our plates at each meal, as our taste buds change as we grow. However, the texture of potatoes literally has made Theo throw up multiple times, so I don’t force him to take a bite. *This post contains affiliate links. If you purchase something through a link I provide, I will receive a small compensation at no cost to you. I have never been the kind of mom who hides vegetables in yogurt or covers them in cheese. I grew up eating them plain and wasn’t thrilled about it, but it turns out I love them now. Bear with me while I explain why I actually now, do in fact, hide vegetables in my children’s food. Theo used to eat everything I put in front of him. Raw kale salad, quinoa, broccoli, meat… you name it, he ate it. Now that little mister has turned 3, he doesn’t like to eat anything. It’s not a matter of taste preference, it’s a power struggle. He will eat a few select vegetables without a fight most of the time: peas, the frozen mixed veggies (excluding the green beans), cucumbers, red pepper, carrots (with hummus)… and I think that’s about it. He also eats avocado, corn, and tomatoes, but those are not vegetables! I know his pickiness is only a phase. I know that since it’s a power struggle if I force the issue, he will refuse even more. Instead, I place his food on his plate, and he has to at least try one bite, and then he can be done if he chooses to be. He still has to sit at the table until everyone is done with dinner, but I won’t force him to eat. One day he will happily consume his broccoli, and the next week have a total meltdown because it’s even on his plate. I still give it to him. Since most nights he chooses not to eat his veggies, I have to hide it somewhere! I am too flipping busy to cook every night. I make several big meals a week, and we eat leftovers. Most vegetables just don’t really heat up well, so our meals were lacking in the vegetable department. Usually, when I make tacos or pasta, I will include in my meal plan checklist (I use this to meal plan and I love it) to make a salad. What typically happens is dinner time comes around and the babies are on the floor screaming and pulling at my legs, and my lofty goals of chopping veggies and making salad dressing go out the window. I used to do meal prep on the weekends, but honestly, sometimes it feels as if my whole weekend is spent cleaning and cooking! So I don’t meal prep quite as much as I used to. Our family is usually very healthy, and we have gotten sick a ton this winter. Lack of veggies? It definitely doesn’t help! I have connected with so many awesome bloggers and Instagrammers since I started blogging. One of my favorite, favorite, FAVORITE Instagram accounts to follow is Karalynne of DeJunkit. Karalynne’s goal is to help families make healthier choices and dejunk the food in their houses. What I really love about her advice is that it is practical for the everyday family. She doesn’t tell everyone to eat raw kale and zero grams of sugar. She will frequently give options that include good, better, and best choices, depending on how extreme you want to be. Friends, PLEASE check out her account! The amount of chemicals and other ‘junk’ hiding in our food is just sickening. 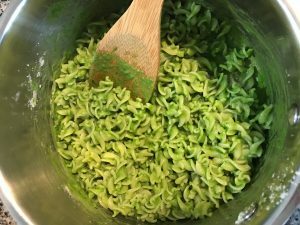 Recently, Karalynne had a post about the amazing power of spinach and challenged us to use it in every meal. I decided to give it a try, not as a substitution for other veggies we were having, but as a little hidden addition! We have had spinach in at least one meal a day all week long. I guess I’ll get to the hack! 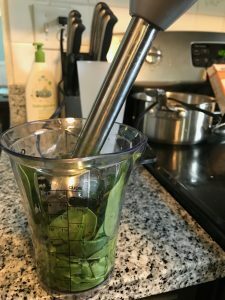 I blend or chop up spinach and put it in EVERYTHING. Literally. It’s like a green, flavorless sauce. You can’t even see it in things like ground beef or meat sauce. 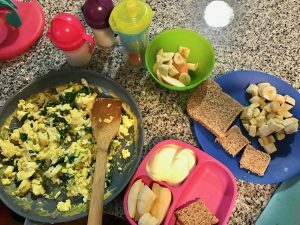 On Monday, we had scrambled eggs with spinach in them. I just added it whole and chopped it up as I stirred the eggs. All of the kids ate it. I told Theo he was going to try a new, green food called Spinach and that it would make him big and strong like Daddy. He tried a tiny bite with his eggs (we refer to eggs as ‘butter cheese eggs’ even if they don’t have butter and cheese in them. Don’t judge me!) with spinach, declared that they were yummy, and ate them all. On Monday night I made tacos. I’ve always added shredded carrots and diced peppers to my taco meat for extra nutrients. Spinach has a very mild flavor and I knew we probably wouldn’t be able to taste it. However, I was nervous that it was going to look ugly! 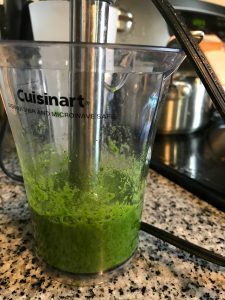 I added a few handfuls of spinach and a bit of water and blended it up with my immersion blender. I blended it until it was a liquid. Added it to some sauteed onions, shredded carrots, and red peppers. Then I added the ground beef, seasoning, and some tomato sauce. 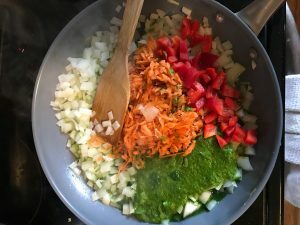 I had to switch pans because of all the extra veggies! You can’t even tell that there’s spinach in it!! Theo refused to eat it because he didn’t like meat that day. *Eye roll* At least he had spinach in his eggs for breakfast, and the babies devoured it. They eat everything, though. On Tuesday I made macaroni and cheese for the lunch for the kids. 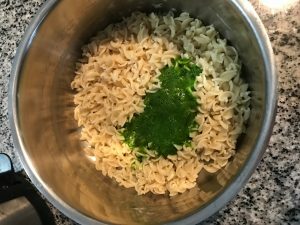 I was really nervous to add spinach to it because I knew it would be really green. 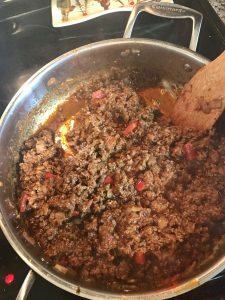 I blended it up the same way I did for the taco meat. It was so green. I told Theo it was special green sauce to help make him strong like Daddy, and he ate it. After he ate it I told him it was spinach added to his mac n cheese. He actually requested to have macaroni and cheese with ‘green sauce’ today. Win! Note: I used the white cheddar Annie’s; it might look gross if you use the regular yellow cheddar. 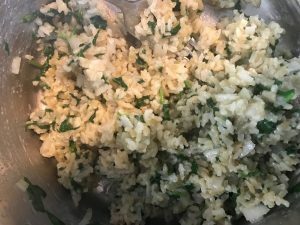 On Wednesday I added spinach to rice. Instead of pureeing it, I chopped up several handfuls of it. I forgot to take a picture of it chopped up, but it was a lot! When the rice was done, I added the chopped spinach, some garlic powder, salt, and a little bit of ghee. I fluffed it together, and let it steam off the burner with the lid on. It was delicious! I’m sorry that these pictures are terrible. I wasn’t planning on doing a blog post about this. The more I did it, the easier I realized it was, and I just had to share. If I let Theo help me get his dinner ready, there is a higher chance that he will eat it. It’s all about power and control. If he thinks he is choosing what he is eating, he thinks he is in control. For example… we had leftover tacos Wednesday night. I told Theo he could choose either taco meat or black beans, red pepper or cucumber, etc. He very happily ate his meal without taco meat. Another tip is to fill their plate with more things that they like than they don’t like. If I make chicken, rice, and broccoli, Theo probably won’t eat anything. If I instead put peas, corn, chicken, rice, and broccoli on his plate, he will happily eat the peas and corn, and then usually eat the rest of his dinner. I’m not saying fill your kid’s plate up with snickers and hope that they will eat some broccoli, but if there are things that they consistently eat, try that. Toddlers are just crazy. Do you have picky eaters? How do you handle it? 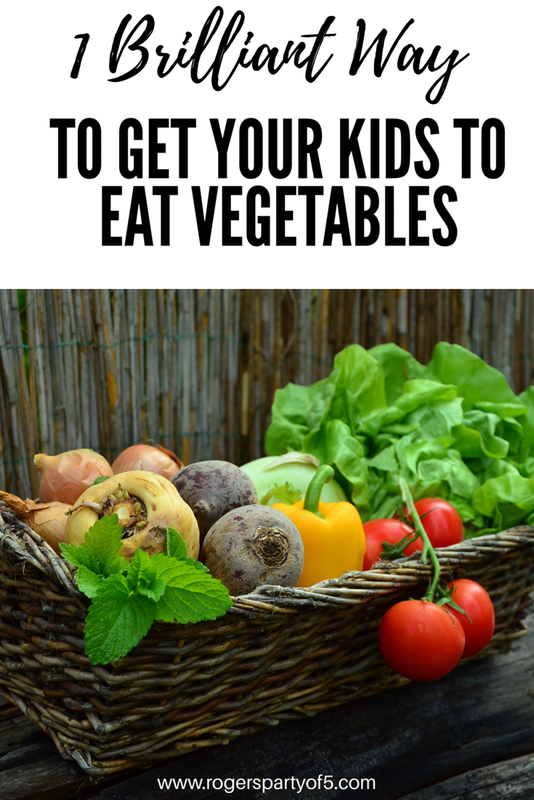 I’d love to hear any tips or tricks you use to get your kids to eat vegetables.